I was going to wait until the 17th to release the February Planning Packet, but they’re ready and I want to give you time to download the sheets and set up your planner for February. These are the same sheets I use and share pictures of a few times a week. It’s also the same one in my planning videos only pre-dated and with my personal washi tape applied to the edge. You can add washi tape like I do or decorate your sheets with stickers. It’s up to you. 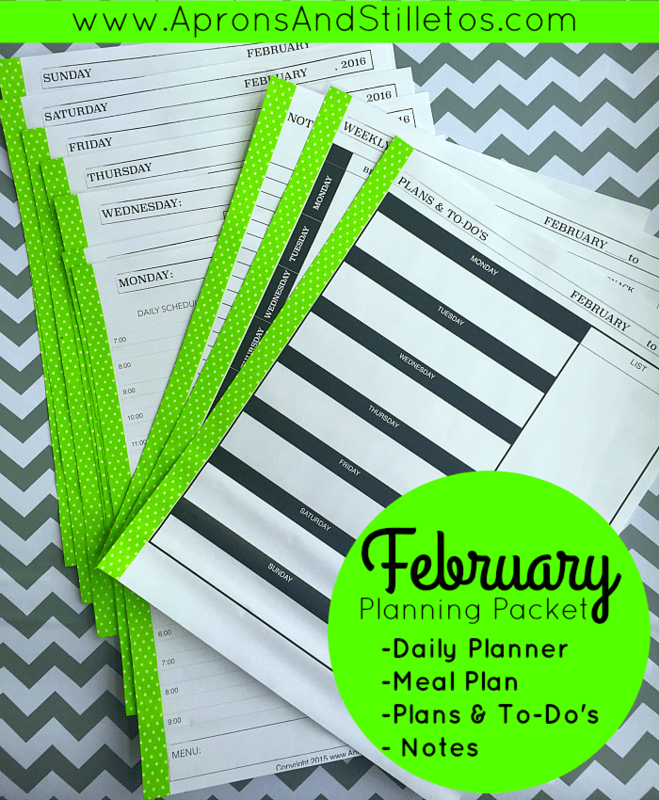 With this packet you will be able to plan out your meals, to-do and lists, a week or a month at a time and also plan along with me on Periscope in February. Here’s what comes in the February Planning Packet. DAILY PLANNER SHEETS: You’ll love the way this page is set up. The daily pages are pre-filled with the day, month and year. All you need to write in is the date. On the left is a timed column for appointments and timed tasks. The right side of the page has four areas to make lists and takes notes. The header sections are blank on the example, but the top two sections are pre-filled with on the February Planner. the top (2) sections are pre-filled with “Home” and “Personal” The bottom two are left blank for you to customize. MEAL PLAN: There’s a weekly meal planner where you’ll be able to plan breakfast, lunch dinner and snacks. You can fill one sheet in per week or four at the beginning of the month for a full month’s menu. PLANS & TO-DO’s: This is my weekly spread and it’s where I map out thing that are going on for the week. It gives an at-a-glance view of what’s coming up. The section on the far right can be used for your important lists for the week. NOTES: The note page is lined and has a space to be dated. It can be used for grocery lists, more to-do’s, brain dumps, goals, accomplishments, gratitude, etc. Once you’ve downloaded the file, you can print of a month worth or a weeks worth of sheets. 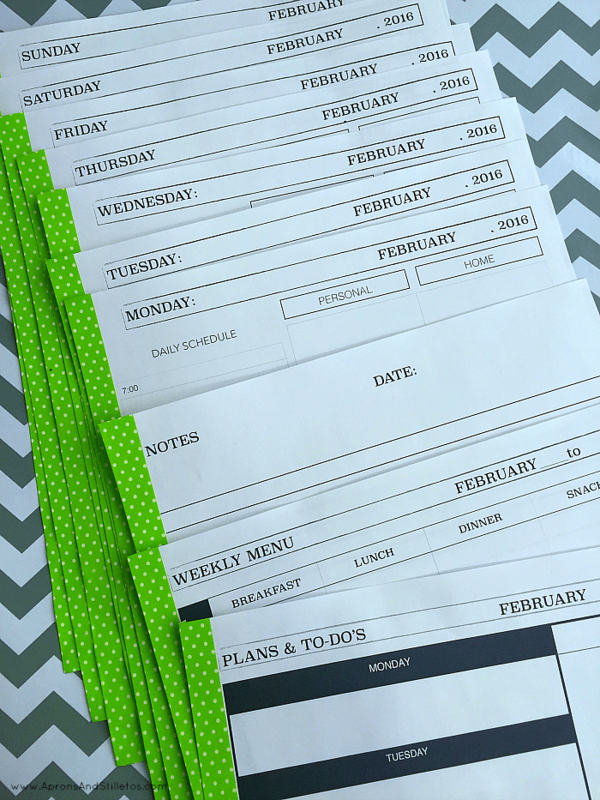 To set up your weekly planner for seven days, print the entire PDF just once. To set up a full February planner print the PDF four times by changing the number of copies in your print preview to (4). You can also print as follows. Daily Planner: Print (4) four copies each of the following days: Tuesday, Wednesday, Thursday, Friday, and Saturday. Then print (5) five copies of the Sunday sheet. Notes: Print as many as needed.